You know am 100% behind that statement. I always tell people, the size of the dog doesn’t necessarily determine what it can and can’t do. This is NOT the real TruMan. To see him in all of this glory, please click the link below. 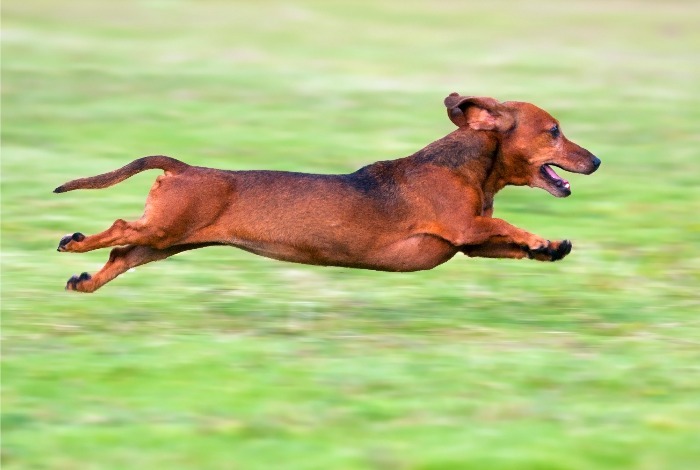 Catra’s mini Dachshund, TruMan, runs with her all of the time. He recently ran a 26.2 mile marathon to help a Doxie named Sunshine that was abandoned in the cold and snow near a dumpster. His little feat of awesomeness raised over $800 toward Sunshine’s medical care. Catra herself is pretty amazing. She says on her blog that she has bee clean and sober for for 17 years. In this really great article, Reborn on the Run, Catra talks about how she used trail running to help her get over her drug addiction. Catra is only one of five people in the world to finish a hundred 100-mile runs (she’s done 116), and only the second woman to do so (Monica Scholz, a Canadian, is the other). It’s true: being in the wilderness heals the soul – whether it be dog or human. TruMan later went on to run a 50k (just over 31 miles)! Both Catra and I (not that I know her) think he is the first Dachshund to run that far. You can read more about TruMan’s marathon adventure here. Catra is going to write a book about her life and her struggles and, of course, TruMan – her “running buddy and essential part of the story” – will be in it. If you are interested, you can help her make her book a reality via her GoFundMe page. Pretty amazing little dog. I know short legged dogs like myself or doxies can run, but our vets have advised against running super long distances, stick to walking or hiking. Katie used to run around 15 miles, she was more the running dog. Bailie is a good runner now, but Mom doesn’t want to do more marathons. That is some impressive running. Wow! I think this is amazing. I’m not sure my dachshund could run or walk that far.